The Black Witch! "An absolute and eternal night is Ariad's only goal." 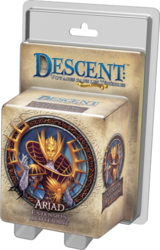 Lieutenant Ariad's miniature instils perfidy and despair in your Descent parts: Journey into the Darkness! This lieutenant expansion also contains the Dark Illusions Intrigue card deck, along with threat tokens, to give the Evil Lord new options and allow him to recruit the threatening Ariad into any Descent campaign: the darkness.